In a recent article, we presented the 100-year history of earnings, dividends and prices for the S&P 500 (and its reconstructed proxy progenitors) provided by Robert Shiller of Yale. Our purpose was to illustrate that dividends not only move in a less volatile way than either earnings or price, but also that dividends are a major part of total return over time. There was a spirited discussion thread, with a significant number who discounted our presentation, because it covered such a long period -- that the world has changed and old data is not useful -- that a shorter-period of modern experience should have been presented. OK, we like looking at data over lots of different time periods. the approximate time period over which now retiring baby-boomers could have effectively conducted a savings and investment program. Our observation and thesis is not changed by going from 100 to 30 years. For that time frame, dividends are much less volatile than earnings or prices, they grew well, and they were a major component of total return. From 1981, dividends were fully taxable at ordinary rates for a majority of the time. They are set to be taxed that same way going forward. Ignoring the recent years with 15% taxes on dividends, we used a 35% tax rate on dividends, and assume a zero interest rate on reinvestment (that they were held in cash in a coffee can, or spent as received). With those assumptions, dividends after-tax accumulated to $879. The ending S&P 500 index price in 2011 was $1,257, and it began at $124 (up $1,133). Dividends and price increased together total $2,012. That means dividend accounted for nearly 45% of the gain. We think that is quite significant. Without making charts or doing calculations, anybody who even makes casual notice of the stock market, would see that since 2000, dividends have been the entire game (unless of course one got in and out at the appropriate times). 30 years is an important time frame for a third reason, and that is that baby boomers retiring near age 65 may live 30 years to age 95. 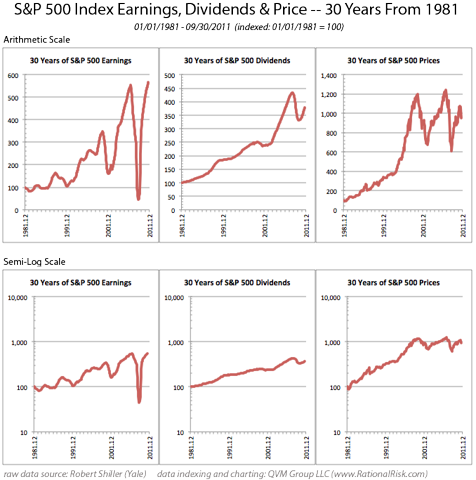 They need to look at the history of dividends (and interest rates and stock prices) and make some critical choices about the how much they can or must rely on bonds, growth stocks or dividend stocks within their investment portfolios. We published a separate article on that topic on our blog earlier today, which may be an interesting follow-on to this post. It is titled; "Retirement Without Income Growth Leads To Financial Death - Bonds Won't Pull The Wagon"
Disclosure: QVM has positions in SPY in some managed accounts as of the creation date of this article (March 26, 2012). Disclaimer: This article provides opinions and information, but does not contain recommendations or personal investment advice to any specific person for any particular purpose. Do your own research or obtain suitable personal advice. You are responsible for your own investment decisions. This article is presented subject to our full disclaimer found on the QVM site available here.